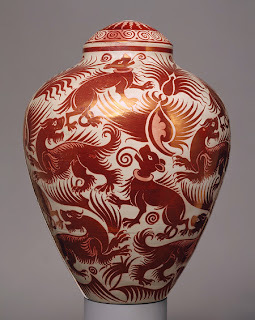 The Metropolitan Museum of Art (New York City) introduces us to a beautiful vase by William De Morgan (1839–1917). "Beasts and dogs among stylized foliate motifs in a ruby luster on an ivory ground decorate this vase by William De Morgan. 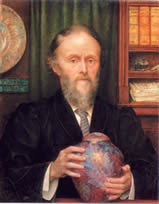 A designer and master potter associated with the Arts and Crafts movement, as well as a founding member of the Arts and Crafts Exhibition Society (1888), De Morgan studied at the Royal Academy Schools before leaving his studies to work for William Morris' firm Morris, Marshall, Faulkner & Co. as a designer of stained glass and a painter of furniture panels. "De Morgan noticed an iridescence that resulted from the firing of silver paint used in the stained-glass process, thus sparking his interest in ceramic luster glazes, for which he later became famous. His inspiration came primarily from Iznik (Turkey) and Persian ceramics as well as Italian Renaissance maiolica and sixteenth-century Hispano-Moresque wares. "In the 1870s, De Morgan (shown here) concentrated on decorating tiles. His mastery in this area culminated in a commission to copy Sir Frederic Leighton's collection of Persian tiles for the Arab Hall at Leighton House, London, in 1879. In 1882, he moved to a larger workshop in Merton Abbey, where he produced and decorated hollowware and continued to experiment with luster glazes." This vase was made sometime between 1888 and 1898. It was manufactured at Sands End Pottery and is 13 3/4 in. (34.9 cm) tall. The De Morgan Centre in southwest London is a permanent home for work by William De Morgan, the Victorian ceramic artist, and his wife Evelyn, the painter. The Centre also houses an archive of papers relating to their lives and their circle, a reserve collection, and a temporary exhibition space. Visitors are welcome.